The world economy has become increasingly globalized in recent decades. Improvement in fuel efficiencies and the proliferation of the internet have certainly helped. According to Citi Research, we shouldn’t underestimate the impact of tumbling tariff rates have something to do with that. 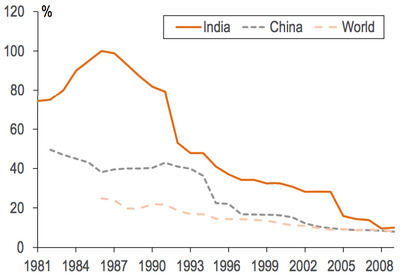 The analysts refer to this chart showing that tariff rates have significantly dropped since the 1980s. “The reduction in trade barriers ease up more than just the movement of goods and services as they often serve as a catalyst for both domestic and foreign direct investment,” they write. India saw the most profound dive. Its peak average tariff rates were around 100% in the late 1980s. And tariffs on specifically industrial products maxed out at over 200% in 1990. By 2009, both those numbers dropped to approximately 10%. 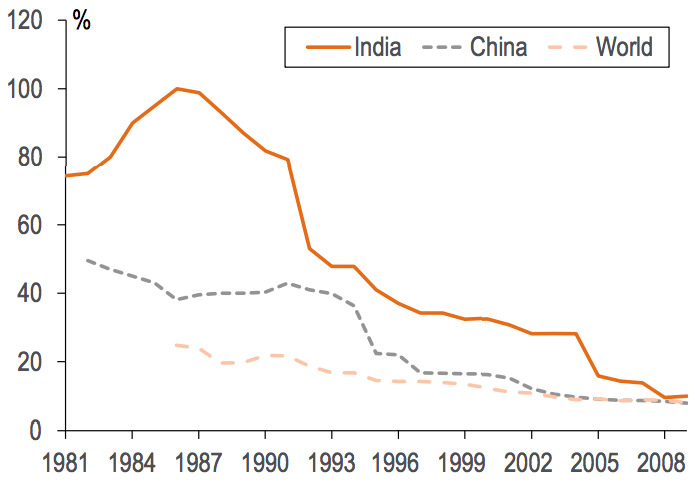 This trend is just one of the factors that may turn India into a leading economic powerhouse by 2050. Other countries also saw major drops. China’s rates dropped from an average of 50% to less than 10%, and the world’s average rates were cut in half to less than 10%. And it’s not only the international trade barriers that have been reduced. Regional trade agreements have also sought out border goals of “deep economic and political cooperation and integration,” which has helped nations develop their internal economies.